Everybody hates the those hefty winter fuel bills. 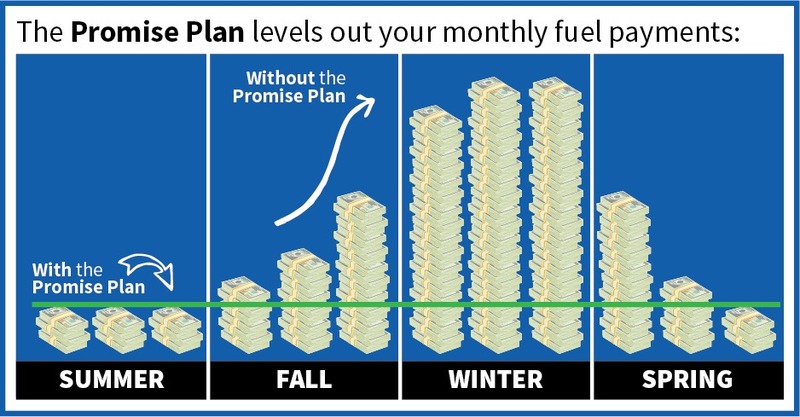 Our level payment program, which we call the Promise Plan, eliminates big winter bills by allowing you to spread out your annual fuel cost over a 12-month period. We estimate your annual propane cost based on previous usage (if you’re a new customer, we base your annual usage on your tank size and usage type). Then, we divide that total amount into eleven (11) level monthly payments. The 12th month is a “catch-up” month – meaning if you used more than estimated, you’ll pay the difference, and if you used less than estimated, you’ll have a credit on your account. No matter how cold it gets, you’ll pay the same level amount each month. You won’t use more fuel than you need. This program makes it much easier to plan your monthly household expenses – which is a WIN-WIN situation! Click here to view Promise Plan terms and conditions. *$100 credit is only available to Promise Plan customers. Non-Promise Plan Automatic Delivery customers receive a $50 account credit if we accidentally let you run out of fuel. You have the option to protect your per gallon price annually with a Price Protection cap, for a nominal fee. With Price Protection, your price per gallon will never go above the set price cap during the period. If fuel prices drop below the capped price, you will pay the lowest price. You’ll have both upside and downside protection. The price cap can be done with or without the Promise Plan. For Promise Plan customers, the price cap applies to the total number of gallons estimated for the current plan period. Any fuel purchased beyond the total number of gallons estimated will be billed at the market price on the date of delivery. The annual cap fee will be rolled into your monthly Plan payments. For non-Promise Plan customers, your price cap fee will be billed up front for the annual period. With the pre-buy option, you purchase your gallons for the year in full at a discounted rate. If you use more than the purchased gallons, you’ll pay the market price for those gallons over the pre-buy gallons. If you use fewer gallons than purchased, gallons will not carry over to the next year. However the dollar value for those gallons can be carried over and applied to future purchases, or it may be refunded at your request.